Is it possible for someone with a strong, Type-A personality to become a more laid back person and stay that way? I hope to find out this year. A few years ago, I made the deliberate decision to leave a high stress job with long hours because it felt like it was killing me a little bit, day by day. I started a consulting practice, giving me more flexibility and more time for photography. In time, however, I just replaced the intensity of my old job with other kinds of intensity. On our frequent photography trips, we never missed a sunrise or sunset and often photographed throughout the day and sometimes at night. When away from home, we filled every waking hour with photography, hiking, seeking out highly rated local food options, or driving and only got enough sleep to keep this fast pace going. While we were home, we wrote three long, detailed photography ebooks in less than a year. I essentially replaced one full-time job with two full-time jobs – consulting and landscape photography. With buying our Airstream and making the decision to travel on a part-time basis, I also made the (for real this time) decision to actually scale back my consulting practice by saying no to projects and setting firm limits on my time commitments. If I am not at home, I can’t go to meetings and if I can’t go to meetings, I can’t do many projects. Being gone for a month is an easy way to help control my schedule (or so I tell myself). I also made the decision to start taking the goal of building our photography business a lot more seriously. So what does all this have to do with Joshua Tree National Park? Well, to start, I am writing this post while sitting in the park’s smallest campground on a warm day, looking out over a plateau filled with massive jumbled rocks, Joshua trees, and a setting sun. It is remarkable what a little distance from the pressures of day-to-day life can do for helping me actually make the shift away from the habits that seem so persistent and obnoxious. Since I do not have internet access here, I have spent the whole day focused on a few writing projects and have made more progress than I ever would at home. The sense that this is not a vacation has also settled in, which makes the internal pressure to photograph as much as possible fade away. Doing things like writing and processing photographs can be an equally valid pursuit to taking photographs, it seems. Yes, this cactus is hazardous. Although another area in the park is named Hall of Horrors, the same name could be used for the Cholla Cactus Garden (pronounced choy-ya), which contains the densest patch of chollas I have seen. Just walking through it made me a little nervous, considering I can be a bit absent-minded when photographing and one wrong step can become a painful mini-nightmare of jumping cholla balls and their sticky, evil barbs. Don’t believe the person who named one species of this cactus after teddy bears… These plants may look fuzzy like a sweet little stuffed animal, especially under the low-angled light of the morning or afternoon, but they are in fact a vicious, evil plant when it comes to contact with human skin. To facilitate reproduction, the cactus drop little balls of evilness that are ready to latch onto any passerby, making another nickname - the jumping cholla - more appropriate. Smart people fear the cholla. The Cholla Cactus Garden during a stormy sunrise. Moving on to a less horrible species of plant… This park is, of course, aptly named. The specimens of Joshua trees along Park Boulevard, between the Jumbo Rocks and Hidden Valley areas, and along the dirt single-track Queen Valley Road, are especially impressive, with some specimens reaching heights of 25 to 30 feet. 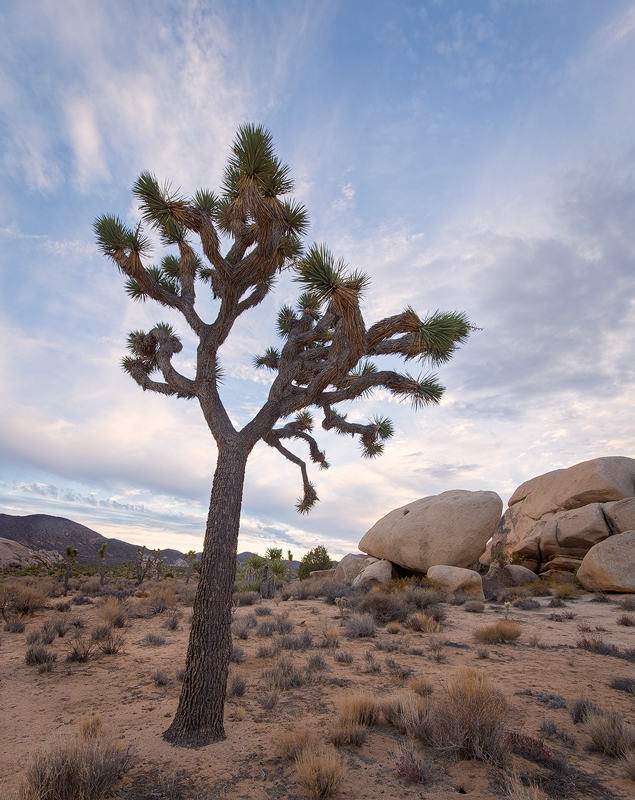 Unlike many other plants in which individual specimens will look fairly similar, Joshua trees each have their own character and personality. Some are elegant and graceful while others are sparse and scraggly, with the latter feeling more at home in this harsh and unforgiving environment. One of the park's namesake trees. The jumbles of massive, bulbous blonde granite rocks also do not disappoint. We have seen similar jumbles of rocks in different places, with the Alabama Hills near Lone Pine, California being the closest comparison. The most curious thing about these rocks is how massive piles of them seem to spring up out of flat ground in some places and form mountains of their own in other places. During our limited exploring, we found the best places to view the rocks in their various configurations to be along the Hidden Valley Nature Trail, the Skull Rock Nature Trail, the Indian Cove area, and the Hall or Horrors area. We also walked out to the Barker Dam area, which would be more interesting in wet years but is still a nice, easy walk. The Arch Rock Nature Trail could have been fun but a photography workshop was blocking access to the arch, so we will have to trust that it is a nice scene since we were not able to actually see if for ourselves (some tips on photography etiquette for anyone who might be interested…). Jumbled granite rocks, Joshua trees, and mojave yuccas in Joshua Tree National Park. During our time in the park, we also hiked to the 49 Palms Oasis (3 miles round-trip, moderately strenuous because of elevation gain and loss). Coming upon an oasis of shady palm trees, trickling water, and signing birds is a nice experience after a hike in the hot sun (this spot was one of Ron’s favorites in the park). We also headed up to Keys View, a roadside stop that helps give context to the features of the Coachella Valley. Here, we experienced Iceland-style, take-your-breath away wind. We barely make it up to the viewpoint and certainly couldn’t stay for long, but still worth the stop. The one disappointment in visiting this park is the sheer difficulty of photographing this landscape. While the busyness of this place is appealing to the eye when viewing it in person, the complexity adds a layer of difficulty that I have not been able to get past for photography. A scene is both at once too busy and too bare, with plants intersecting all over the place and bare patches of dirt doing nothing but catching my eye and holding it to the point of feeling overwhelmed by it all. Abstract renditions of a mojave yucca, Joshua tree bark, limbs of a Joshua tree, and Joshua tree tines. Although we have not been here at any other time of the year, winter seems like a nice time to visit. With the exception of a full day of rain, the days have been warm and the nights cool but manageable. Only the main stops, like Jumbo Rocks, have been filled with people and solitude has been easy to find. And, the landscape holds a great deal to explore for anyone who appreciates stark, surreal desert environments. Because Ron needs reliable internet to work and such internet is not available in the park, we did not stay for as long as we had hoped and didn’t have much time to explore but will definitely be back. Next time, I think we will choose spring when more of the plants have come to life and the weather is just a bit warmer because both aspects are good for landscape photography (the latter mostly in the motivation to get up for sunrise department). If you do not care about such things, winter would be a good time for a visit. Recommended guide book: Since we have authored two guidebooks, we are picky in this area... Joshua Tree: The Complete Guide by James Kaiser is a well-done, thorough and helpful guidebook. Food: We always like a good meal and had two during this part of our trip: Crossroads Café in the town of Joshua Tree, California and the 29 Palms Inn Restaurant in 29 Palms, California. We would recommend both for a solid, tasty meal. The Vons in Yucca Valley and Stater Bros in 29 Palms were the best grocery store we found. Campgrounds: The park literature is quite generous in describing the campgrounds as accessible for RVs. In driving around looking for possible options, we only found about a dozen sites that would accommodate our 25’ Airstream and truck. Larger RVs would have quite a bit of difficulty in finding a site, especially during a busier time. In terms of vibe, we much preferred the feel of the smaller campgrounds, especially since we were mostly alone during the middle of the week at the campground we selected (Belle). Another thing worth noting… We came in through the Cottonwood entrance and the sign at the visitor center noted that all of the northern campgrounds were full as of 10:00 am on a Monday in January. That was not the case and we are glad that we did not rely on that sign for making a decision. As of our visit, the more primitive campgrounds are $10 per night and the two campgrounds with water and flush toilets are $15 (Indian Cove and Black Rock). Cell Service: Almost none in the park. The best service we had in the park was at the junction of Pinto Basin Road and Park Boulevard (3 bars of AT&T 3G). We also had bits of Verizon service around the Belle Campground with our signal booster and along the road between the North Entrance Station and the Pinto Basin Road junction. The library and McDonalds in 29 Palms had decent wifi. 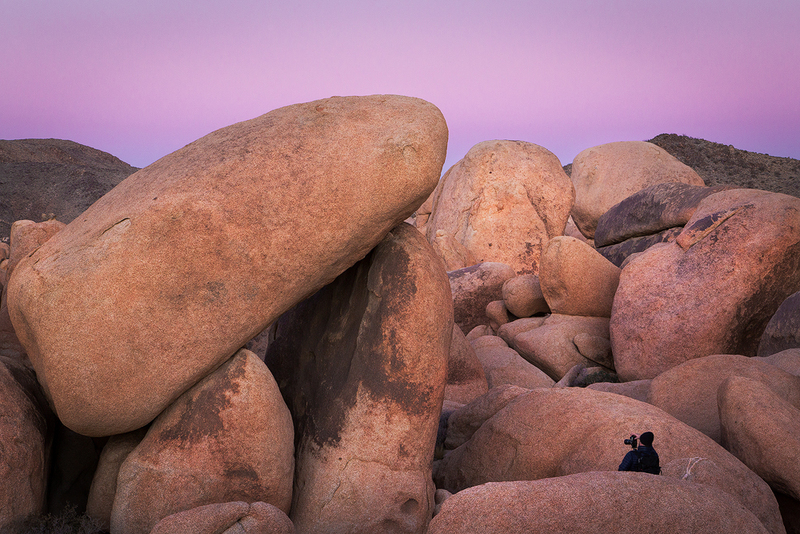 For scale, Ron among the granite boulders.